Inspired by conversations on the Food52 Hotline, we're sharing tips and tricks that make navigating all of our kitchens easier and more fun. 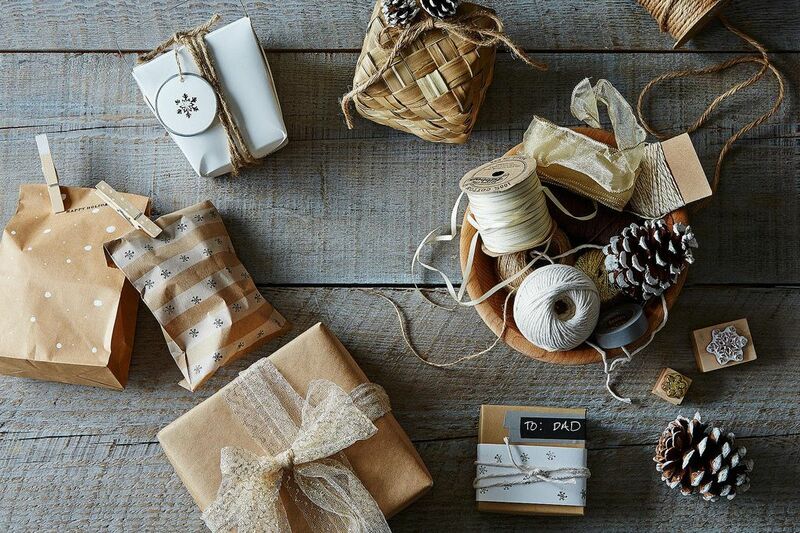 Today, we're helping you wrap the prettiest holiday presents. The world's population can be divided into two groups: those who wrap their holiday gifts early and carefully set them aside (or hide them), and those who sit up until 3 AM wrapping presents in a frenzy the night before giving them. Whether you're a procrastinator or a plan-ahead type, you'll still want to have your paper, boxes, and ribbons at the ready for a wrapping marathon, whenever it happens. Read on for our favorite gift wrapping tips, and make sure to be good this week -- we wouldn't want to see any Food52ers on the naughty list. There are a wide variety of ways to package edible gifts: cookie tins, cellophane bags, tupperware -- the list goes on. 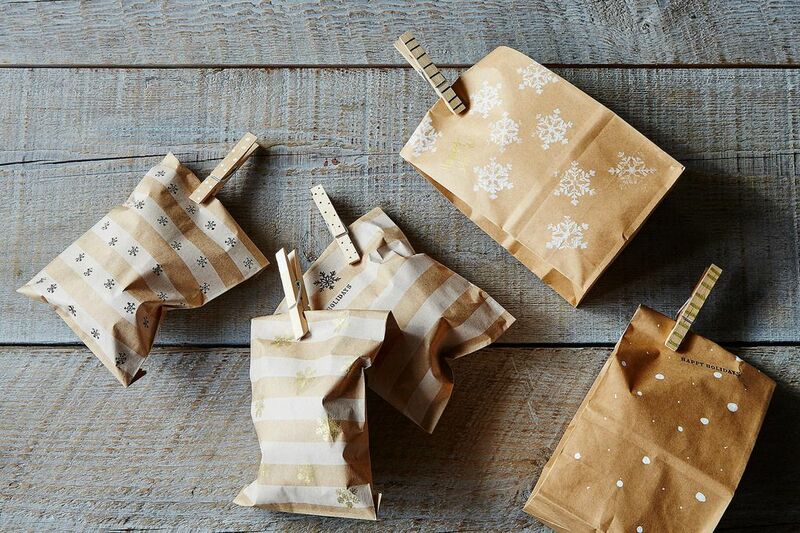 One of our favorite techniques is a DIY gift bag: buy some small bags in bulk, embellish them with stamps and markers, and fill them with your favorite holiday treat. More: Want sturdier packaging for your treats? Try this bakery box set. We dressed up these simple striped paper bags with rubber stamps and a silver pen, and then filled them with Spice-Brined Pecans. While the package may be small, the personalization and care that goes into these treats make them a gift that anyone would be happy to receive. They are also a great way to give gifts to a large number of people; bring a bunch to the office, and you'll score some serious points with your coworkers. We're big fans of simple, understated presentation brightened up with small details. 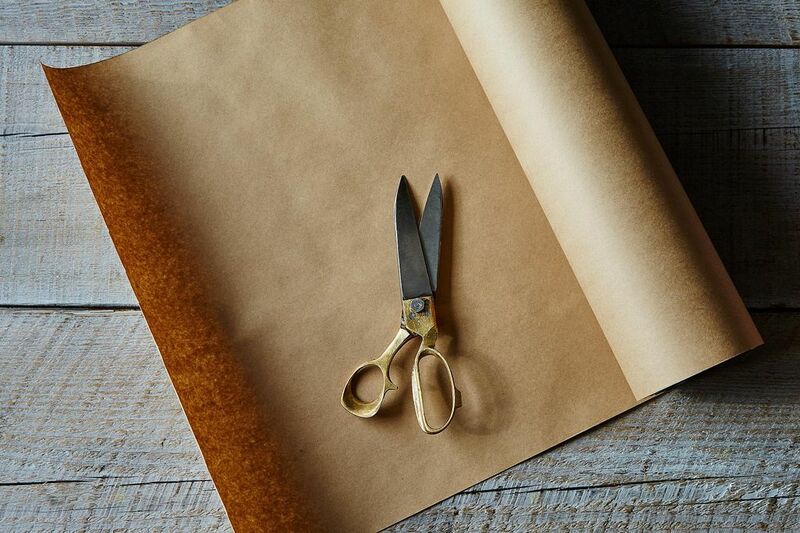 Unwaxed butcher paper (also known as Kraft paper) provides the perfect blank canvas, and is very easy to work with. It folds well, too, so you won't suffer from that crinkle-breaking phenomenon that often results from trying to make crisp corners with traditional wrapping paper. As an added bonus, you can buy it cheaply in large quantities, and it will never go out of style (no need to worry about how you'll feel about dancing snowmen or neon menorahs next year). Amanda likes it because you can use it for any occasion, from Christmas to baby showers, and dress it up with whatever ribbons or decorations you like. Simple wrapping paper means more leeway to get colorful with labels and tags. Multi-colored tape makes great labels, and a silver pen adds a touch of sparkle. Looking for other ways to dress up kraft paper? Decorate it with rubber stamps, or let your kids decorate presents as an art project. More: Here are some of our favorite baked goods that are perfect for gifting. 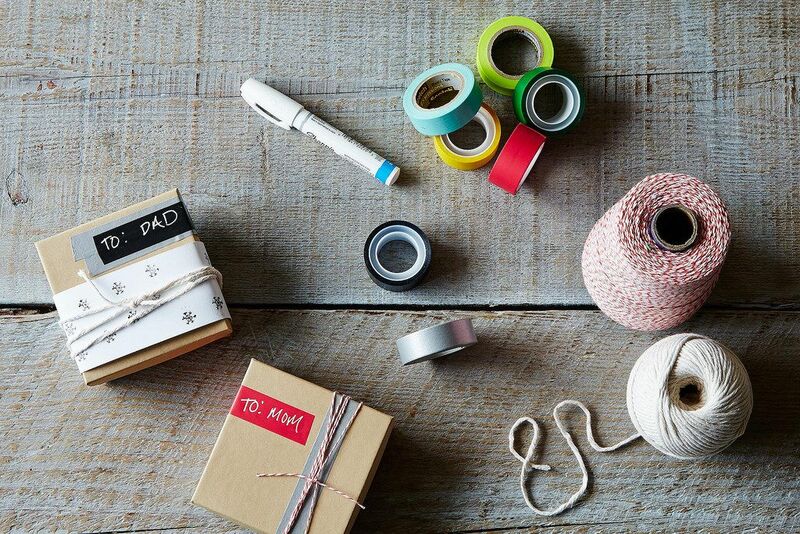 Ribbon options abound, and they're another great way to embellish simple packaging. 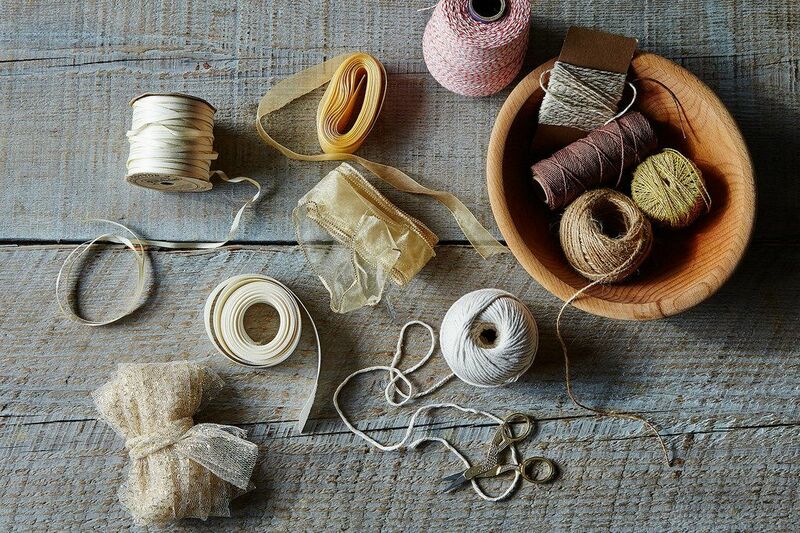 There's traditional ribbon, twine (and glitter twine), and grosgrain ribbon, which you can buy in bulk at fabric stores. Minimalists (or lazy wrappers) rejoice! If your box is pretty enough, you don't need any paper. Save any beautiful boxes you acquire throughout the year, and repurpose them for gifting when you need to. 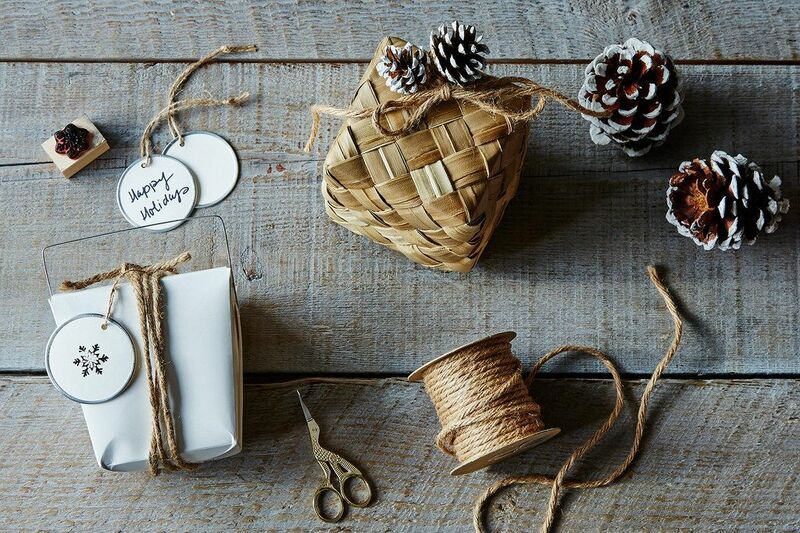 Simply wrap them up with ribbon or twine, and let their beauty speak for itself. And if you receive one, don't be afraid to regift it -- we won't tell. Whatever you do, don't let gift wrapping make you crazy. Simple decorations will always suffice; you don't want elaborate packaging to distract from the thoughtful gift inside. 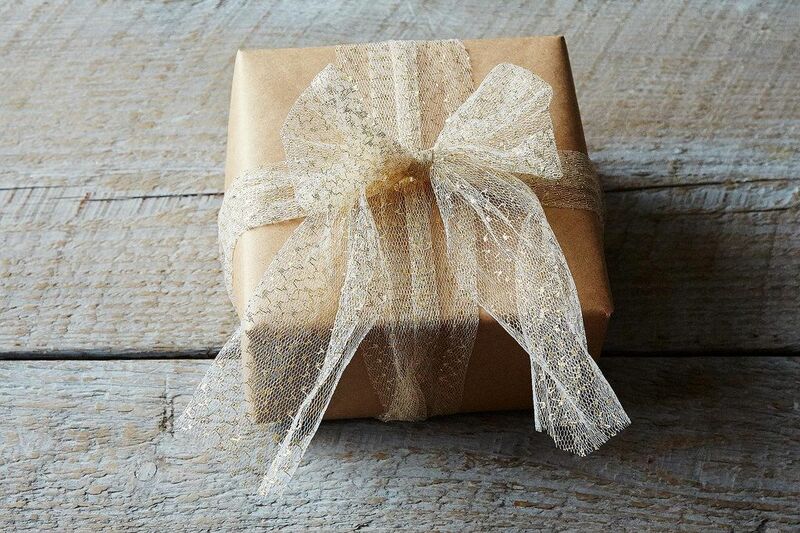 What are your gift wrapping tricks? I typically only use white wrapping paper or brown Kraft paper. For Christmas sometimes I wrap with white paper only and use shiny gold ribbon and bows and tags to match. It looks so beautiful and elegant! Of course you can use any color ribbon. Sisal twine looks beautiful, as well. I use brown craft paper and shiny ribbon or twine or little lengths of lace. Anything really! You can really dress up little inexpensive gifts to look like you got them at an upscale store. White and brown paper goes for any occasion and costs so much less than printed occasion papers. You don't have to match up patterns or worry about being short on a wrap job. You can keep your wrapping supplies down to one small box. It's a win! Beautiful post. I never think to decorate my paper itself, and now I'm thinking the idea of kraft paper (as it can be used for multiple occasions) is looking like a great plan. What would be the best way to prevent grease stains with kraft boxes/paper? I would like to give out cookies in kraft boxes but find that the butter seeps through and makes unsightly marks. Are there kraft boxes with plastic coating on the inside to prevent that? I'd consider lining with parchment or wax paper -- it will also make cookie breakage less likely! Wrap gifts with decorative dish towels, especially from Anthropologie (sales off season)...as an added gift. GREAT IDEAS! I buy all kinds of trimmings, paper and fabric at tag sales and save them for the gifts and gift baskets I make. 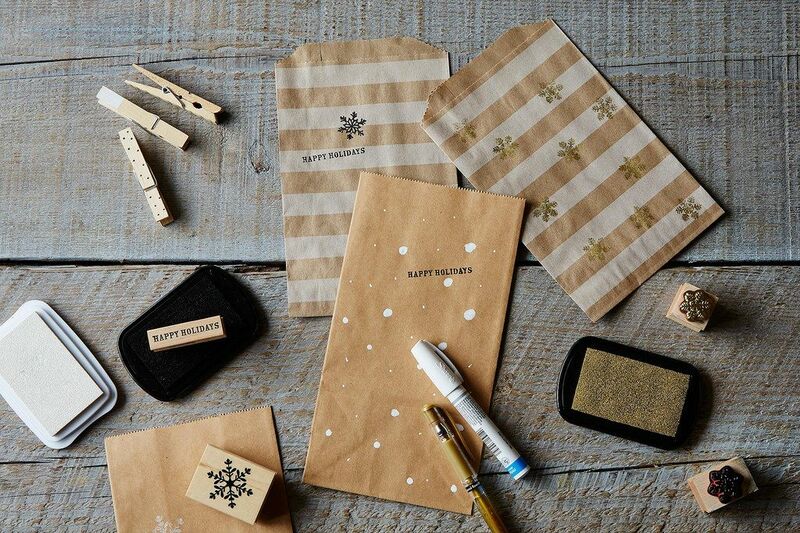 The brown paper is one I have to try because I have zillion stamps for ever occasion! Thanks again! Where are the little striped bags from, please? If the box is simple, I sometimes tie a little ornament or treat to the ribbon as an extra little gift. Bells, Holly on wire (silk holly if the recipients are cat-owners), and candy canes all add a nice little panache. I enjoyed wrapping my gifts with handmade poms poms. I just heard from one my swap that she has them hung on the Christmas tree. Yes! My kids and I made an armload of them from garage-sale wool yarn, intending to string them up as a garland, but in the end used them on gifts. So pretty. NY Cake and Baking Co has a nice variety of clear bags and small containers for baking.